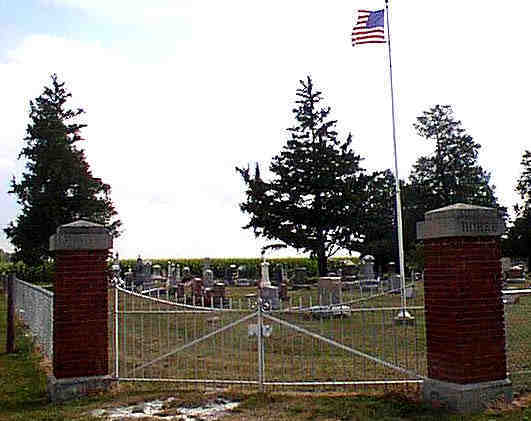 Most of the following information is taken from the book "Van Wert County Ohio cemetery inscriptions" publised in 1990 by the Van Wert County Chapter of the Ohio Genealogical Society. Data in the book was originally obtained in 1982, was updated in June 1988. The book is available in the Brumback Library. Additional data from 1988 to 1998 are at the end of this page based on a personal tour of the cemetery by Meaghan Good. Each bullet in the following list represents a separate stone. Abbreviations used on the stones include: d=died or days; w/o=wife of; s/o=son of; m=months; y=years; d/o=daughter of. Jones, Gertrude M. d 24 Feb 1906 25y 4m 10d wo W.W.
Morgan, M. H. b 23 June 1833 at Paris, Llangwyrmfon, South Wales, d 28 Oct 1902 at Venedocia O. 69y 5m 5d. Morgan, Hugh d 27 Oct 1872 9y 8m 27d s/o Wm H. & E.
Jones, Robert aged 9m s/o R.K. & H.E. Richards, Martha d 8 Sept 1873 ___y 7m 7d d/o J. & M.
Jones, Evan d 14 Mar 1873, 1y 16d s/o J.L. & M.
Morgan, Mary (Davis) d 16 Dec 1875 34y w/o Morgan H.
Jones, Walter Guildford d ___Jan 1868 __8m s/0 John J. & M.A. Davies, Edward B. d 29 Sept 1878 57y, Ann (Davies) d 4 Apr 1904 75y w/o E.B. Tudor, Elizabeth Ann d 6 Sept 1873 5m 18d d/o O. & S.A.
Tudor, Alvin d. 15 Aug 1879 9m 2d s/o Owen & Sarah A.
Edwards, Margaret d 19 July 1882 15y 4m d/o T. & M.
Lloyd, Elizabeth, d 8 Aug A.D. 1872 49y w/o John D.
Roberts, Mary E. 1920 d/o J.G. & M.E. Roberts, Annie Esther 1904-1906 d/o J. & M.
Richards, Thomas E. d 14 May 1880 24y 5m s/o J.D. & D., Jno D. d 30 May 1897 69y 16d, Elizabeth d 20 Mar 1871 43y 1m 23d w/o Jno D.
Parry, Edna E. d 17 Sept 1880 1y 10m d/o E.T. & E.
Edwards, Annie Frances d 26 Sept 1880 1y 13d d/o D.H. & M.D. Jones, Ivor d 14 Oct 1880 2m 5d s/o T.J. & M.
Jones, Rachel C. d 12 Sept 1873 8m 26d d/o T.J. & M.
Rees, Anna 20 Jan 1871-16 Mar 1922 51y 1m 26d d/o E.C. & M.
Rees, Rachel 29 July 1864-18 Nov 1917 53y 3m 20d d/o E.C. & M.
Morgan, Edna 19 Feb 1904-22 Sept 1905 d/o T.S & E.
Morgan, Evan d 13 Nov 1892 1y 8m 10d s/o J.E. & E.
Rees, Jane 3 Dec 1868-3 May 1901 32y 8m d/o E.C & M.
Morgan, Mabel d 30 June 1898 10y 2m 26d d/oE.T. & A.E. Morgan, John P. d 7 Sept 1895 3m 13d s/o H.H. & R.
Evans, Davis L, d 26 Feb 1886 36y 1m 12d, David d 6 Oct 1882 2y 8m s/o D. & A., Margaret N. d 13 May 1883 19y 10m d/o E. & S.
Hughes, Elizabeth b 26 Oct 1866 d 22 June 1897 at Toledo O. 30y 7m 26d w/o W.J. Hughes, Thurston d 21 Sept 1892 6m 10d s/o H.J. & L.A.
Jones, Henry J. d 26 jan 1882 1y 5m 1d s/o J. Mor & M.A. Williams, John d 16 Sept 1880 11m 11d s/o R. & Jane E.
Lloyd, inf s/o E. & R.
Lloyd, Sarah W. 25 Dec 1884-14 Aug 1896 d/o R. & E.
Davies, Elizabeth Ann (Jenkins) d 5 Oct 1886 40y 1m 20d w/o Evan T.
Hughes, Elenor d 6 Feb 1896 74y 6m 29d native of Wales, Robert R. d 1 Jan 1891 72 y 1m 22d native of Wales MAE LLEWYRCH EI WYNEB YN DWYN Y FATH HEDD NES DIFFODD ENWOGRWYDD A DYCHRYN Y BEDD. Williams, Wm Edmund d 25 Jan 1891 1y 6m 10d s/o W.H. & E.E. Williams, Stella J. d Feb 1883 3m d/o W.H & E.E. Edwards, J.J. 1858-1943, Mary A. d 15 June 1901 35y 6m 5d w/o J.J.
Jones, Evan Clarence d 28 Apr 1898 3m 15d Beloved s/o H.S. & M.
Thomas, Mary Jane 4 Apr 1862-28 Mar 1905 w/o R.E. Jones, Lizzie Ann d 19 Nov 1901 6y llm 8d d/o D.S & C.
McNeal, Myrtle d 2 may 1898 1m 18d d/o J.B. & N.L.